I have written here more than once of one of my favorite New York dining experiences, maybe the only place that would get me to utter the dread phrase “Chicago doesn’t have a [blank] as good as [name] in New York”— Yakitori Totto, the second floor walk up kinda divey totally awesome yakitori/izakaya/robata place. 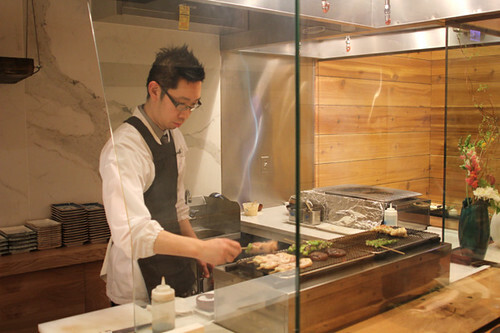 I don’t expect to ever find its exact equivalent, since you can’t open a new place with a been-around-for-20 years vibe, by definition, but I’ve held out hope that someone could at least make robata items as interesting and varied as what Yakitori Totto grilled on its tiny bincho grill. The basement is called Charcoal Bar, a cozy little black-walled inner sanctum. Like The Office at Next/The Aviary, it’s a bar trying not to feel like a commercial enterprise, and while I have no great need for insider exclusive experiences, I was instantly won over by the intimacy of this little space where (if you snag one of the six bar seats like I did) you can just hang out with mixologist Matthew Lipsky as he does crazy things like chip a perfect ball of ice for his Old-Fashioneds. That was actually someone else’s drink; I ordered one called the Narcissus, which combined aged rum with a whole egg, among other things. As he was straining it it looked like pancake batter, but the creaminess of the egg and the fruit and alcohol blended into a remarkably light yet wintry drinks, one of the best cocktails I’ve ever had. 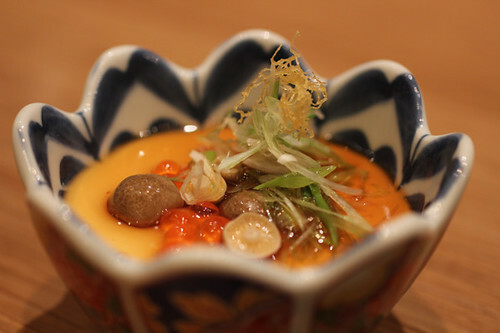 Then it was upstairs to Sumi, where Kato and sous chef Justin Romine make delicate little things for you. Not all are grilled; some of the best were just simple cold things, like a cured cucumber which was crazy good (Anthony Todd said he wished bars had that instead of peanuts to build up your salt thirst for beer) or the housemade tofu with salmon roe, a gorgeous little bowl with creamy tofu that was almost like butterscotch pudding. 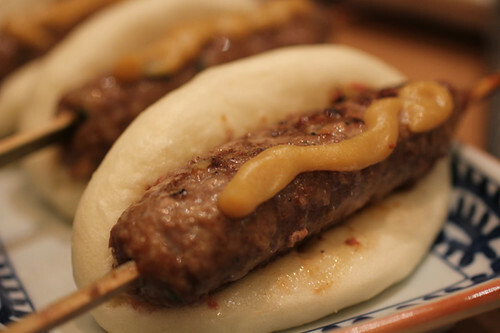 Even the thing that seemed kind of sheer audience-pleasing, a slider consisting of a sausage on a bao bun, was startlingly well-made (we joked that we’d be seeing it again at the Green City Market BBQ). 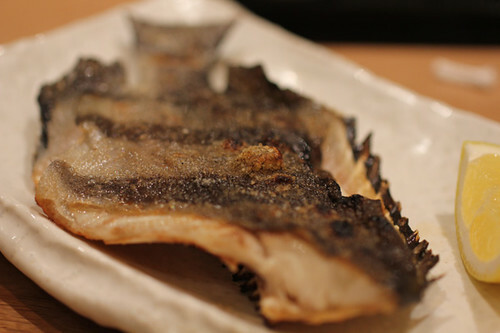 In an age of giant restaurantosauruses, Sumi Robata Bar is a little jewel box of a place devoted to the most direct and simple way of presenting beautifully crafted food straight from the kitchen to the diner sitting right in front of it as it’s made. It’s remarkably satisfying to see someone realize the vision in their head so completely and successfully, and not only is this by far the closest thing to the Yakitori Totto in my head that has opened in Chicago, I feel certain it will be among my favorite new restaurants of the year— and one last note: I usually expect to get hosed at a small plates place like this, small plates adding up faster than you expect, but in fact we ate everything we wanted and got out, not counting most of the drinks, for about $50 per person. That’s not cheap but it’s up there with Kai Zan for delivering a lot of Japanese quality for a highly reasonable price. The cocktail booklet at The Barrelhouse Flat is a beautiful thing, not merely laid out beautifully (though it is, in the finest imitation-1890s look desktop publishing can create) but compiled with a historian’s love for lost worlds; and the cocktails I tried were extremely well balanced and bright tasting, filled with interesting things which worked together cleanly and precisely; they taste like everything is there for a reason. The space, at least the downstairs (I understand the upstairs is somewhat different, but it was booked for a party), is a little spare, or would be if the lights were up, but it at least suggests the period as well, and I saw signs that the service could be inviting if you talked to one of the booklet’s authors directly (I got someone else and the service was, sadly, airport-bar-blank). The food, on the other hand, is like a greatest hits of other hot places at the moment— Longman & Eagle, and Maude’s/Au Cheval, that mixup of haute and offal and farm to table and late night comfy drunk food that Longman pulls off and Au Cheval overdoes— and which at The Barrelhouse Flat costs you a fair amount of money to not work at all. Wanting to try them at their most extreme and Au Cheval-esque, I ordered something called Breakfast at Dinner, which somehow combined a biscuit (first-rate), a corn pancake (dry and stiff), a thimble of sausage gravy (runny and thin), some pickled onion and a reddish, Chinese restaurant-style sweet-sour sauce… and $15 from me for a portion of mostly flour-based food that’s about half the size of the $5.99 biscuits and gravy at any diner (and a fraction of what $15 gets you at Au Cheval, for what that’s worth). Which I admit is complaining that the food isn’t good and such small portions, but really, this was just a WTF dish, not just made for drunks but apparently by someone with alcohol-impaired judgement, too. When it was gone— which wasn’t long— I ordered some brussels sprouts which were, at least, competently roasted if a bit over salted. But that was $21 in for a pretty odd, unsatisfying meal, money much better spent on drinking here. After a Key Ingredient shoot downtown I popped into Farmhouse for a quick lunch, and again marveled at how much better food is downtown than when I was a cubicle jockey subsisting on Wall Street Deli and Oasis Cafe. Farmhouse is a beer and farm-to-table focused joint; on the beer side you have a bartender who’s eager to tell you about the local brews they pour and give you tastes. I didn’t actually want to drink a beer at lunch but he was happy to give me samples to taste which made lunch that much more convivial than water would. On the food side— I’d call it Longman Lite, but that sounds like a dig and really it’s the opposite. It’s great that the food and atmosphere of a long afternoon’s slacker lunch in Logan Square has been adapted to the hour-lunch needs of office workers, slightly stripped down and lightened up yet without losing its fundamental pleasures. I had a shortrib sandwich, full of soothingly tender Slagel or Q7 short rib topped with housemade onion jam and blue cheese— a great combination, a little sweet yet with tang and funk. For a side, instead of fries I was able to have a cast-iron pan full of nicely charred brussels sprouts (apparently the official vegetable of winter 2012-3). I hear good things about the guys behind Farmhouse, who are apparently doing very well and plan to open a second in Evanston, another place with a woefully underserved captive audience. They’re doing God’s work. I used to use Super Bowl Sunday as an opportunity to get into places that are hard to get into, like Avec. They’d be half empty and grateful for anyone who showed up. This worked for a while, but over time it became harder to find a place that fit the bill— Avec brought in a projection TV, Purple Pig just outright closed without notice that day, etc. etc. And frankly, I don’t find it that hard to get into anywhere any more— except for Next, there’s always some time you can walk in, you just have to rearrange your life to fit it. So this year I just tried to think of somewhere downtown that I hadn’t been that I would enjoy not having its usual crowd, at least. The winner was Sable. That made one of us who won something. I’ve never had the waitstaff at a place tell me so many times that the menu was going to be fun, the food was meant to be fun… to just have fun. By the third or fourth time I understood that repeating “fun” like a mantra was a way of lowering expectations for the food— if I thought this list of early 2000s upscale comfort food clichés was “fun,” I might not be that demanding about wanting any of it to be particularly good. Bacon-wrapped dates, a beet salad with goat cheese, short rib sliders, fried chicken and waffles, a charcuterie plate inexplicably dotted with supermarket berries in the dead of winter, a gooey chocolate dessert— there was nothing on the menu I hadn’t had before, and unfortunately, nothing that was better than any previous time I had had it, either. Most were, in fact, kind of lackluster— next to Sable’s short rib slider, with its too-sweet sauce and few wan onion strands on top, suddenly the housemade onion jam and blue cheese on Farmhouse’s scintillated like culinary genius. 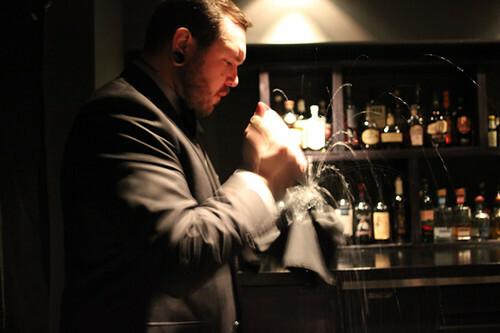 The actual star here is evidently not the kitchen but mixologist Mike Ryan’s cocktail repertoire at the bar, steeped in cocktail history and documented in a voluminous cocktail list. And I’m sure these bar-snacky not-quite-dinner items (you’re hard pressed to find a green vegetable side dish here, for instance) go down more easily if you’re sitting talking the arcana of classic cocktails with him, and food is merely something to go along with your cocktails. Disclosure: I was known to Sumi/Charcoal Bar and was sent a couple of items by the chef, but otherwise paid for everything. I was just a regular schmoe at the rest.